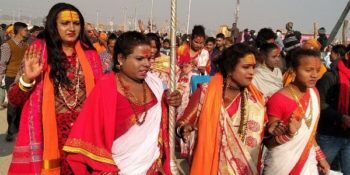 Prayagraj : The inclusion of the Kinnar Akhara led by transgender activist Lakshmi Narayan Tripathi is drawing huge crowds at the ongoing Kumbh Mela, the spiritual congregation here. 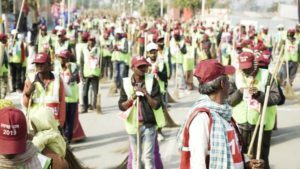 While most of the traditional norms being followed, on Tuesday, Tripathi led the Kinnar Akhara in joining Juna Akhada men as they together participated in the long procession that lead up to the Sangam, the confluence of the Ganga and Yamuna rivers and the mythical Saraswati. 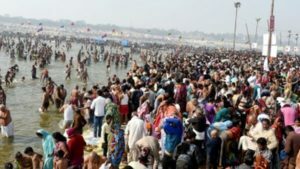 As representatives from the transgender community took the holy dip on the auspicious occasion of Makar Sankranti, slogans of “Har Har Mahadev” resonated in the air. Hundreds of devotees gathered around them to witness the landmark moment. “Our religious scriptures texts show the significance that transgenders were given in ancient India. I could not be any happier at this special moment. I am sure this will give a moral boost to all members of our community to call for more freedom and acceptance in public,” Tripathi told IANS. 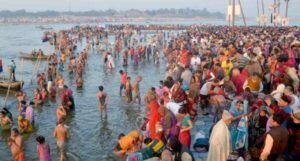 The 1979-born transgender, who has also acted in Hindi movies besides being a noted Bharatanatyam dancer, further said that the holy dip will mark the rise of a new era for the community in India. Tripathi maintained that jobs are the most piercing problem for the community at large. “Why do you think most Hijras are only beggars,” she asked, pointing out that employers are still unwilling to offer jobs to transgenders. Tripathi said educational institutions too need to show openness when it comes to the acceptance of transgenders in schools and colleges.